And much more… Check-out the demo! 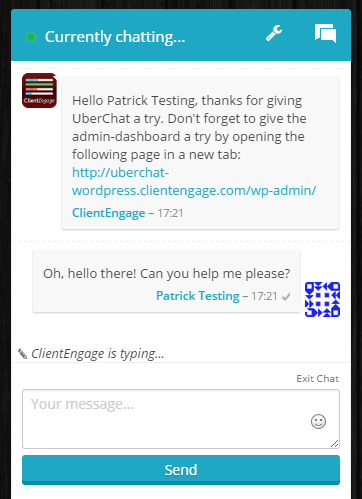 UberChat also comes with the unique feature of having a Windows-based client included out-of-the-box – giving you a beautiful, native interface to actively engage your website’s visitors through operator-initiated chats. 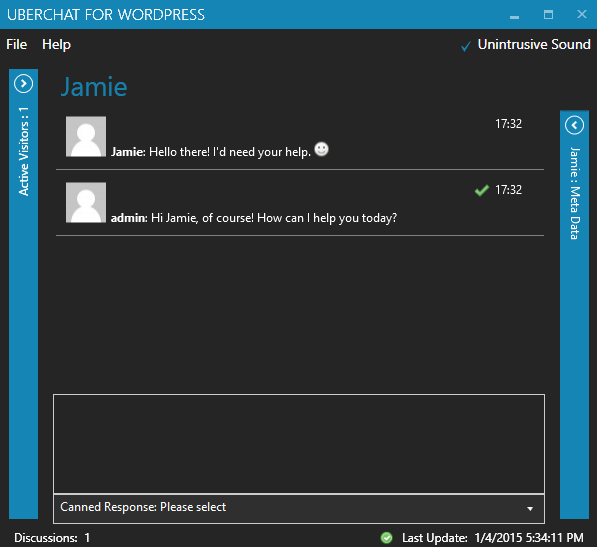 UberChat is the only live-chat plugin that also has a Windows client. The native client means that you can keep UberChat running in the background without it getting in your way. Whenever a visitor initiates a chat with you, you will be notified with a visual and audio notification. You can also adapt the look & feel of the Windows client. Several pre-defined colour-themes and audio notifications are there for you to pick what you like. Not using Windows? 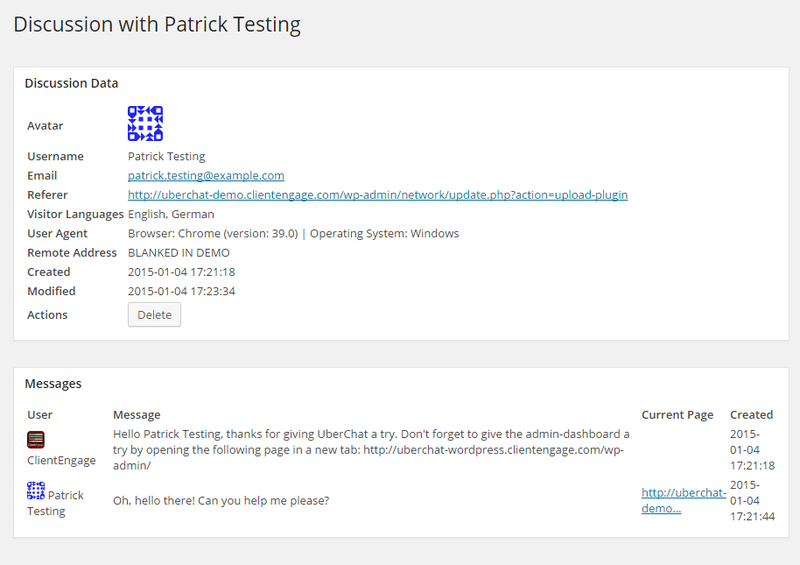 No problem: of course, UberChat also has a fully-featured web-interface that you can use from within your WordPress admin. The interface provides you with all of UberChat’s functions. 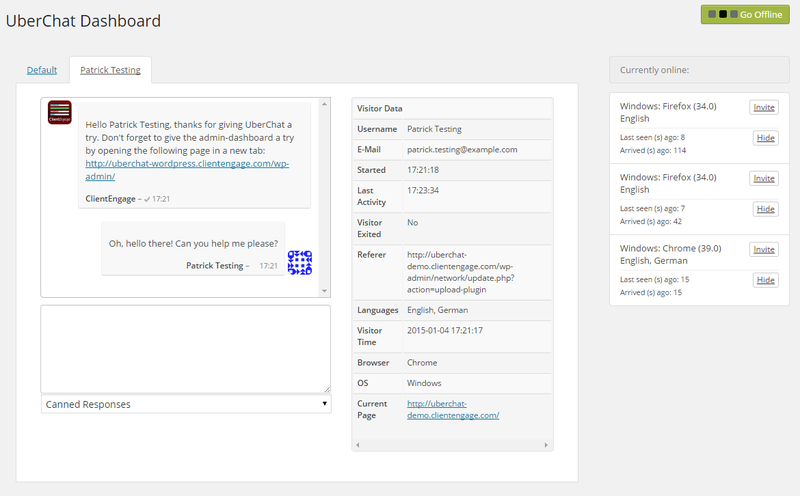 The operator interface shows you a list of all visitors (non-admins) currently browsing your site. 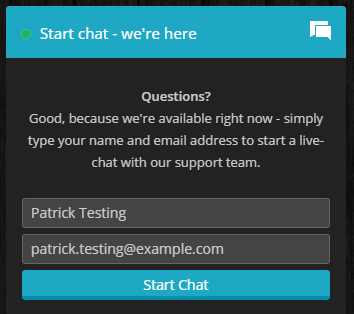 With a click of a button, you can actively invite them into a support chat. Unlike subscription services, there are absolutely no recurring fees when choosing UberChat. After purchasing the one-off license, you may use it as much as you want and as long as you want (see the CodeCanyon Regular License for more information). 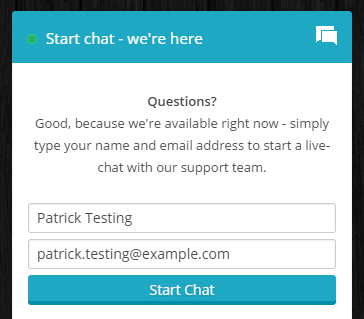 You can create answers to the most frequently asked questions and then select them when you’re chatting. This way, you save yourself and your visitors valuable time when servicing discussions. You can choose any colour as your chat’s primary colour. 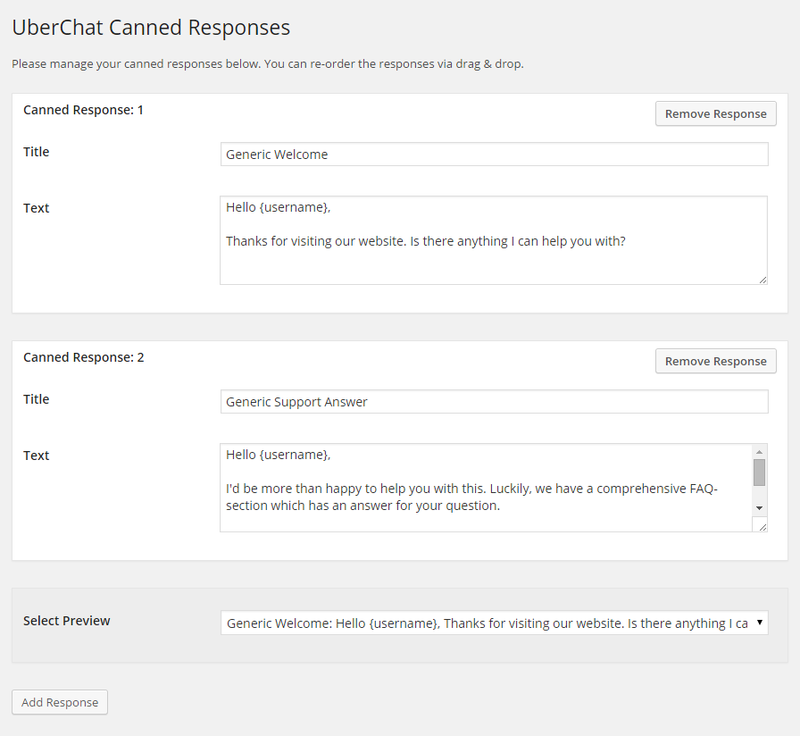 This way, UberChat will seamlessly integrate with your site’s look & feel. 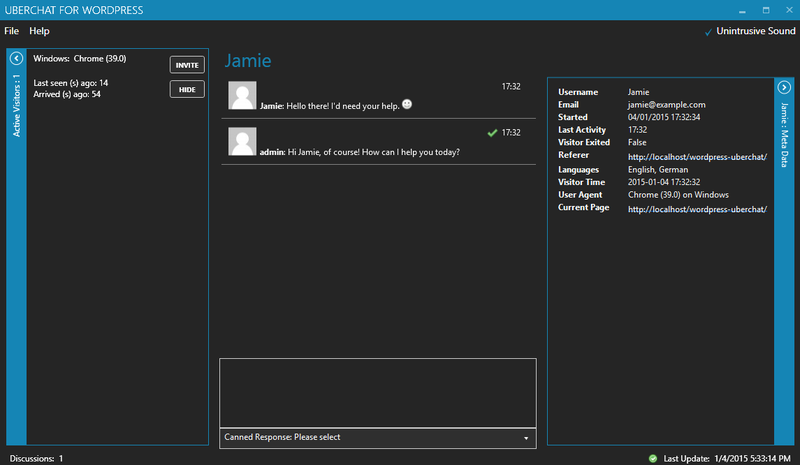 Additionally, UberChat also has a beautiful dark-theme which you can activate on darker themed websites. Not online 24/7? Not a problem! 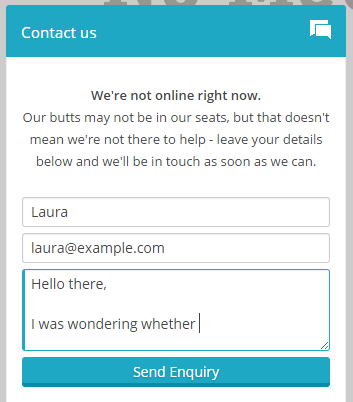 UberChat will fall-back into the enquiry-form mode. Visitors to your website will be able to send you email-messages which you can read at your convenience. UberChat was built with internationalisation in mind: currently, English as well as German are included. 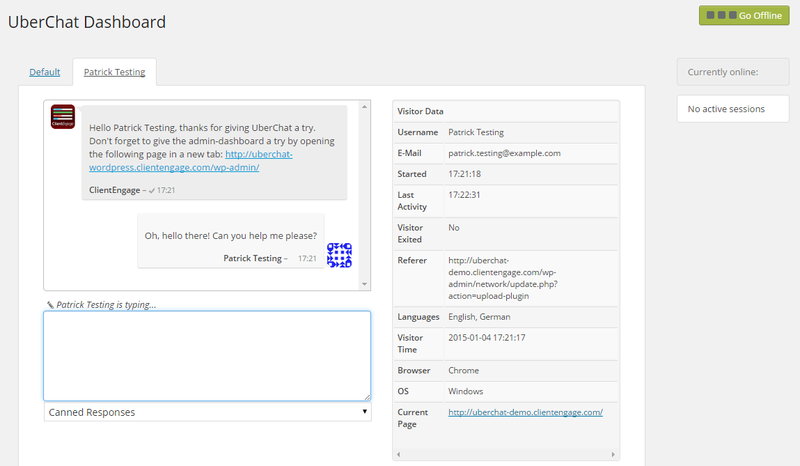 That said, you can easily translate UberChat into any language by translating the included po-files, or by using WPML. UberChat was developed so as to support WordPress’s network-site feature. 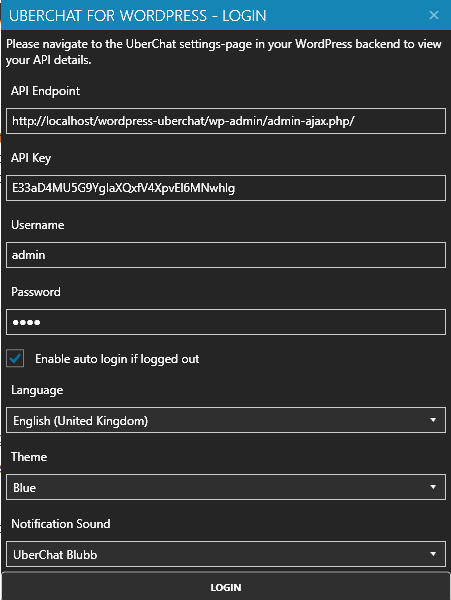 But remember that all network sites act like totally separate installations – the Windows client can only connect to one site at a time. The chat-interface shows you a range of useful metadata about the visitors you chat to – including the page they’re on, their referrer and accepted languages. 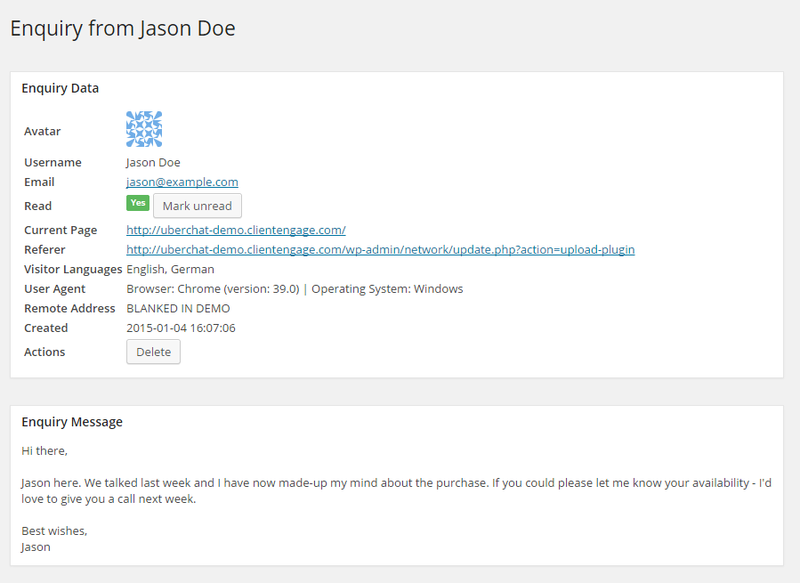 This chat system employs AJAX technologies and does not rely on WebSockets for its communication. This means that anyone can run UberChat, as long as your server fulfils the requirements outlined below. However, this also means that this system is not intended for heavy-duty use: so don’t build the next Facebook and try to have 10m people use this at once. That being said, on average server-specifications, there is nothing stopping you from having 10-15 concurrent conversations.